A place to share stories and history of the Southeast Steuben County region. April 27, 2018 April 27, 2018 Linda Reimer 200" Disc, Corning, Corning Glass Works, Corning Museum of Glass, Corning NY, First Congregational Church, Local History, New York State History, Palomar Mountain Observatory, Public Library, Southeast Steuben County Library, Southern Tier. Hi everyone, here are the Local History Photos of the week! Photo 1 shows a postcard of the old First Congregational Church of Corning. And it features a neat notation on the bottom of the photo – “Where I went to church.” Who wrote the notation and sent the postcard, not to mention who received it – are mysteries. However, where the old church was located is not! 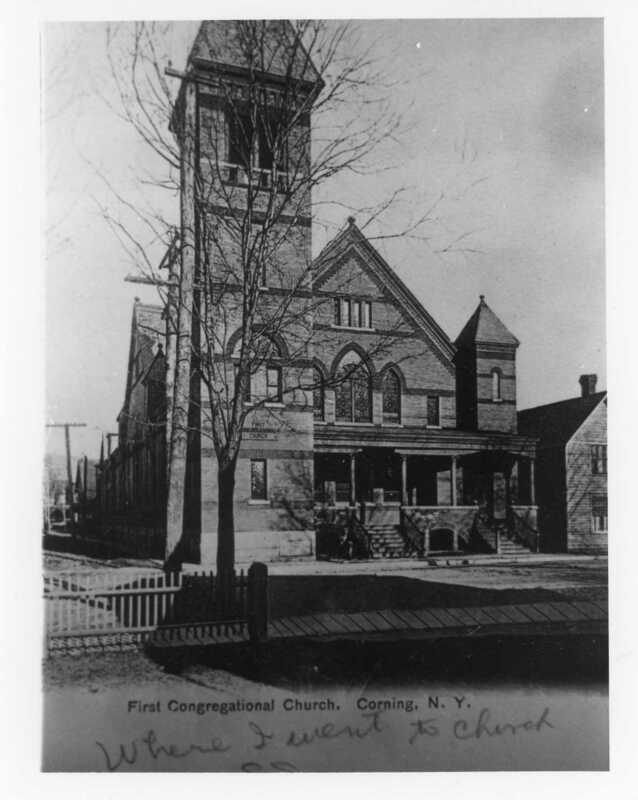 According to the website for the First Congregational Church of Corning, the church seen in the photo was in existence from 1890 to 1961 and was located on the corner of Bridge and Ontario Streets in Corning. The new and modern First Congregational Church building, built in 1961, is located on Pulteney Street and is still in use today. The original 200″ glass disc, made by Corning Glass Works for the Palomar Mountain Observatory in California in the 1930s, suffered damage due to a break in the molding while the disc was being poured. The glass makers poured a second disc that was completed in perfect condition. The second disc went to the Palomar Observatory. And the original disc has been on display in Corning in the years since then. 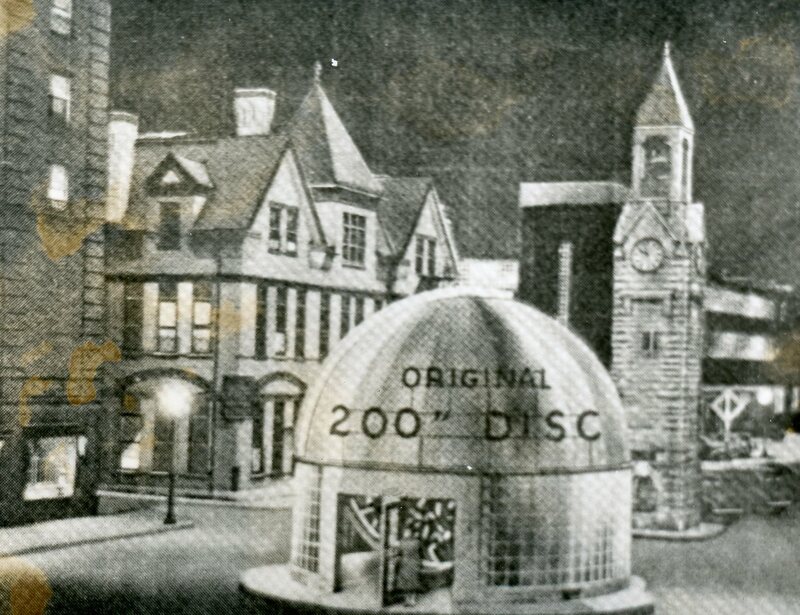 Today the glass disc can be viewed in the Corning Museum of Glass but for a number of years after the disc was first made it was housed in a special building in the area that now encompasses Centerway Square. 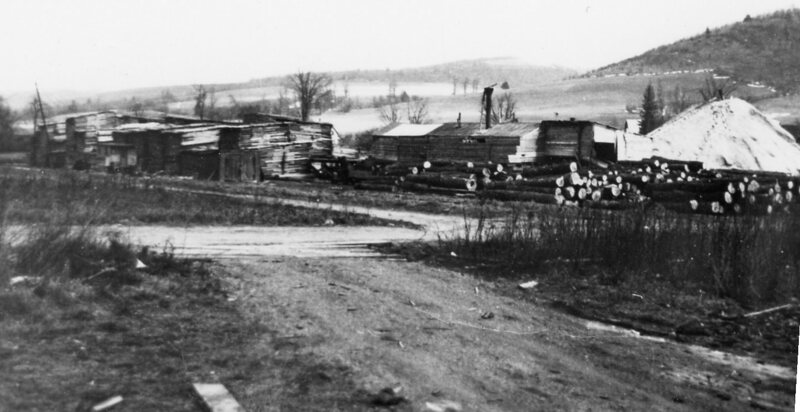 The clock tower in the background stood sentry then and still does today. At the library you can scan your photos and slides to create digital family albums and slideshows; and even use one of the Circut machines, and other Creation Station equipment, to help you create a special paper family history album. Also of note, we have the local paper, at times called the Corning Leader, Corning Journal or Corning Daily Journal, on microfilm from 1840 to the present — so you can visit the library and research local history and your family tree if you wish! And if you find any old photos of the Corning area that you don’t know what to do with – you can always donate them to the library! We’re happy to add new photos to our Photo Archive! April 21, 2018 Linda Reimer Bridge Street, Bridge Street Service Station, Corning, Corning NY, Flood of 1972, Flood of 72', Flood of'72, Hurricane Agnes, Local History, New York State History, Public Library, Southeast Steuben County Library, Southern Tier. I was six in 1972. So although I vaguely recall being woken by my on mother on an early morning in June of 72, to go out in front of the house our house on Pine Street, and look at the flood waters flowing down Market Street towards Denison Parkway, I don’t recall what many of the local buildings looked like before the Flood of ’72. So the building seen in photo 1 looks vaguely familiar to me; however, I can’t recall where I saw it! If you recognize the building in the foreground, or background, of this photo – let us know! And here is another photo that I believe was taken during the Flood of”72. 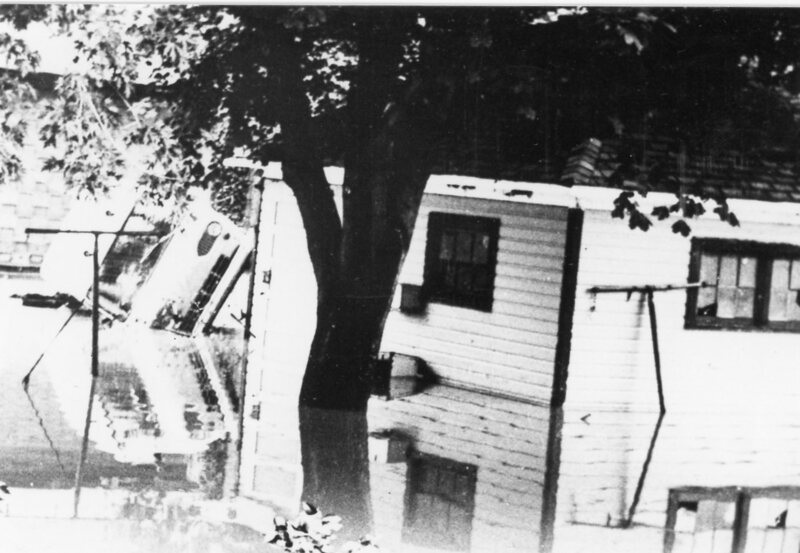 Despite the damage and the danger, at the time to local residents, it is a neat photo with the flood damaged house in the foreground and the bus seen tipped on its side in the background. 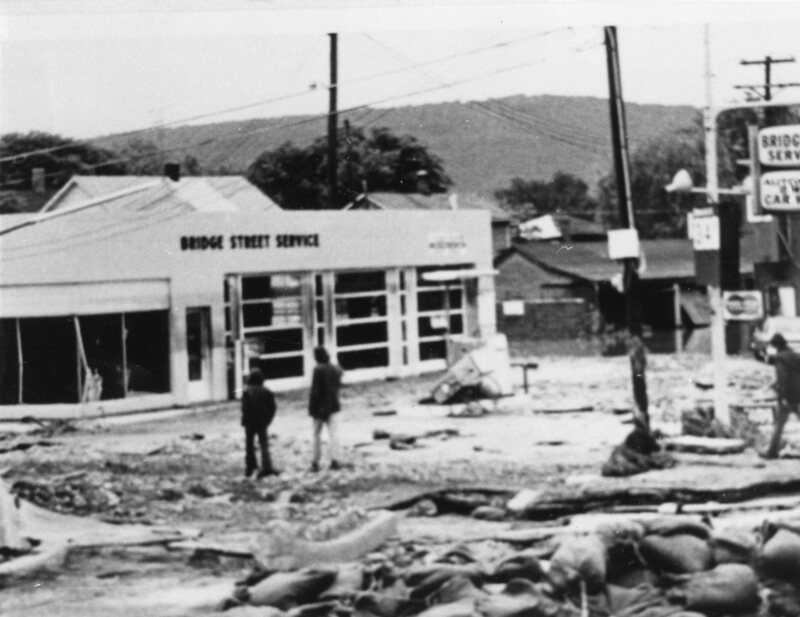 Our bonus photo for this week is of the old Bridge Street Service Station in the aftermath of the Flood of 1972. 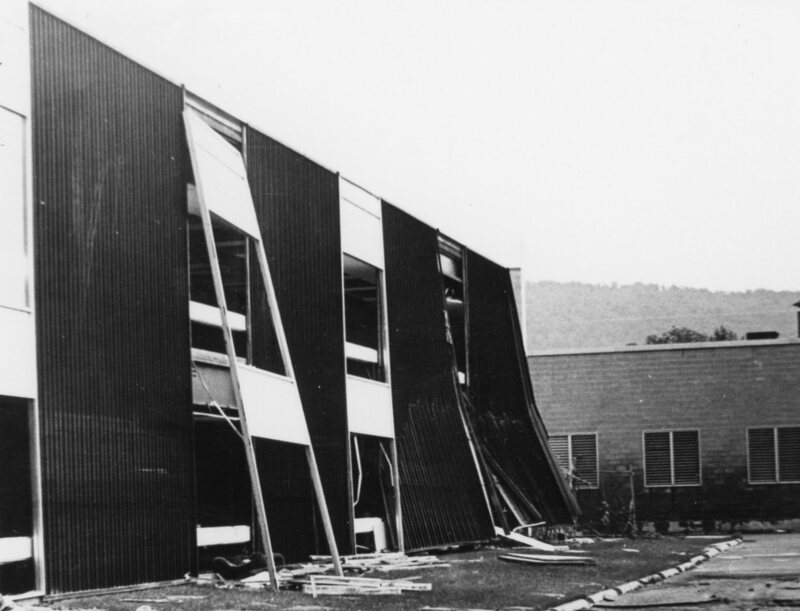 What are your memories of the Flood of 1972 and its aftermath? If you’d like to share them with us, and all the readers of this blog, please do! You can even come to the library and we’ll video tape your flood stories, share them on this blog and give you a copy to share with all your friends and relatives! April 13, 2018 April 13, 2018 Linda Reimer 1920s, Corning, Corning NY, First Street, Hamilton Street, Local History, New York, New York State History, Painted Post, Painted Post New York, Public Library, Southeast Steuben County Library, Southern Tier. Our photos for this week are of streets in Painted Post, New York. Both photos were taken in 1921. 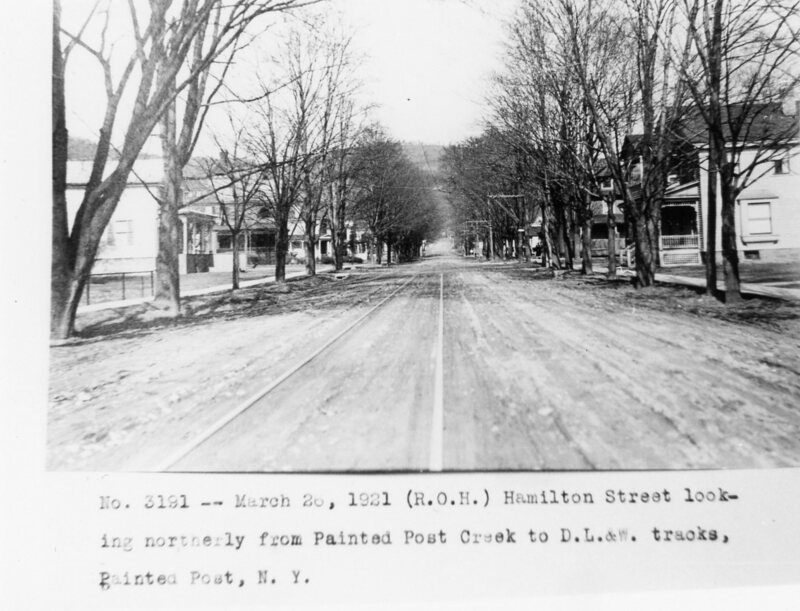 Photo 1 offers a view of Hamilton Street in Painted Post looking northward toward the railroad tracks. Photo 2 for this week shows an unpaved First Street in Painted Post and, it really blends the old transportation with the new! 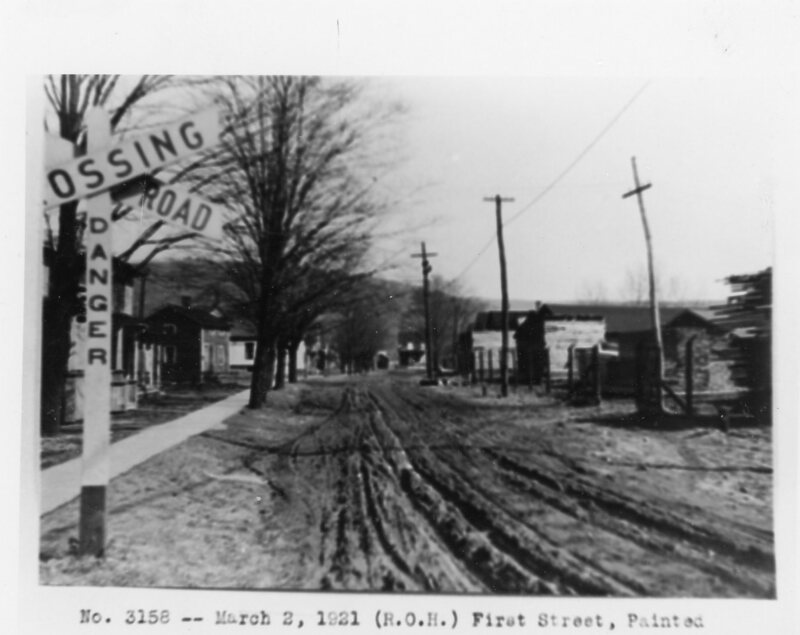 You can clearly see the railroad crossing sign in the foreground and the grooves of horse drawn carts running down the middle of the street. What a great photo! April 6, 2018 Linda Reimer Corning, Corning NY, History, Local History, Logging, New York State History, Public Library, Southeast Steuben County Library, Southern Tier. 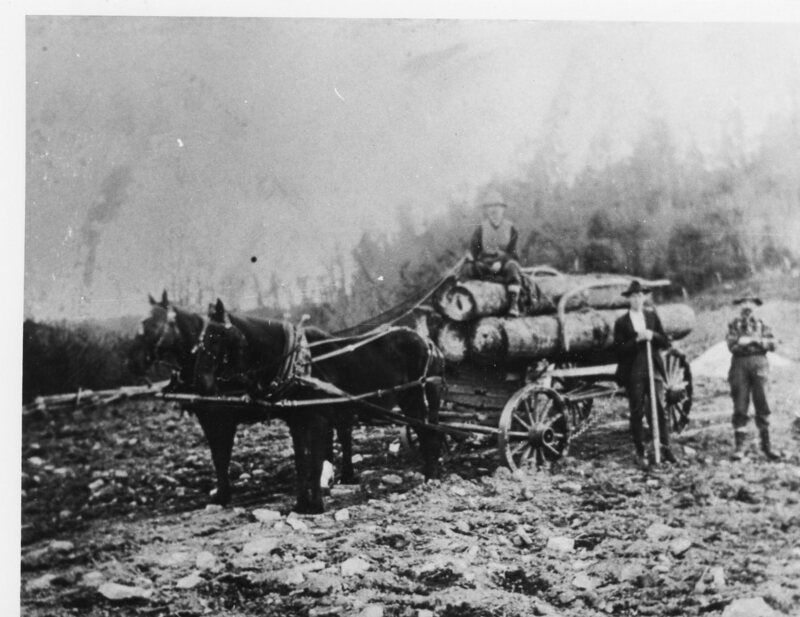 Photos 1, 2 & 3 all relate to the logging industry that once was a booming business in our area. 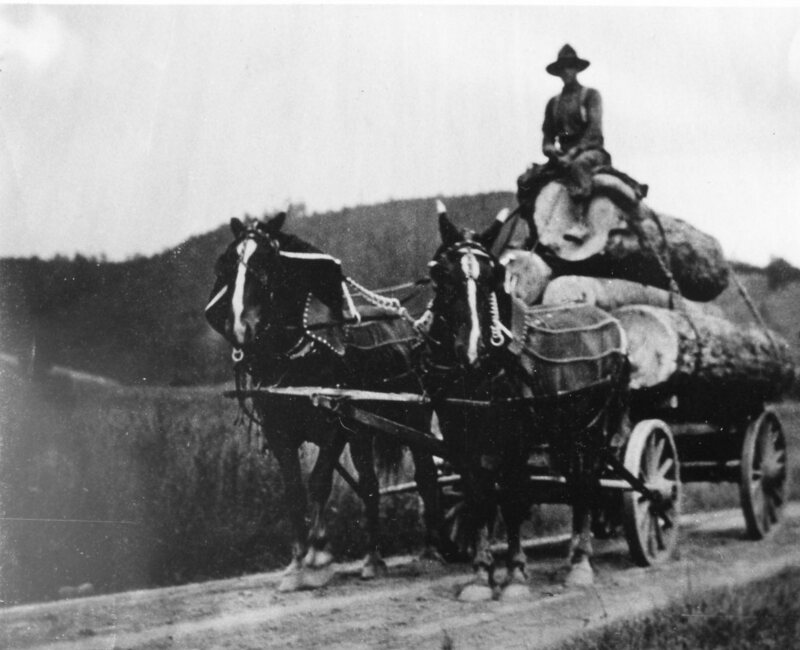 If you have any stories to tell about logging in the days of old – please share them with us! Click here to be notified of new posts! Monday, Wednesday & Friday: 9:00 a.m. - 6:00 p.m.
Tuesday & Thursday: 9:00 a.m. - 8:00 p.m.